The Narrows is the most secluded section of the Arkansas and offers non-stop rafting action, especially during higher flows. Trips launch north of Buena Vista where the snow-capped 14,000 Collegiate Peaks are often visible from the river. The river is very fast here with very few calm pools. Be ready to maneuver through drops, falls and rock gardens the entire time. 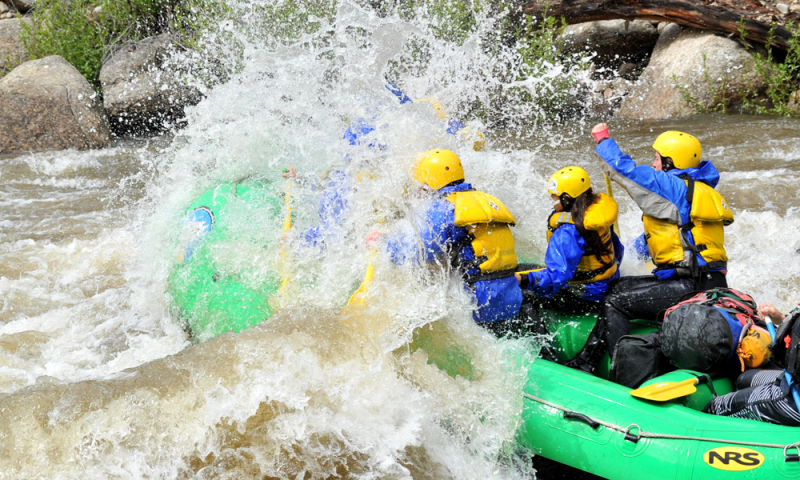 Rollicking whitewater rapids such as Frog Rock, The Miracle Mile, and House Rock are some of the more memorable drops you will encounter. 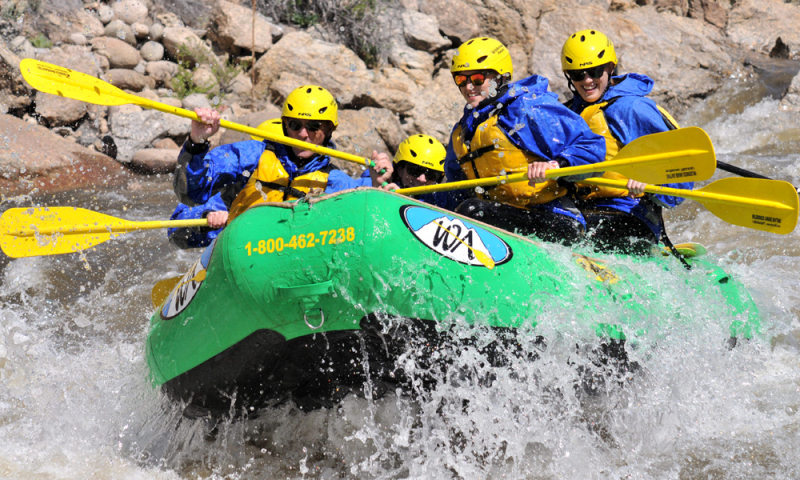 The Narrows half day rafting adventure is an excellent option for folks that are looking for a half day of whitewater rafting and have already experienced our Browns Canyon Half Day or Full Day. What is difference between Browns Canyon and The Narrows? 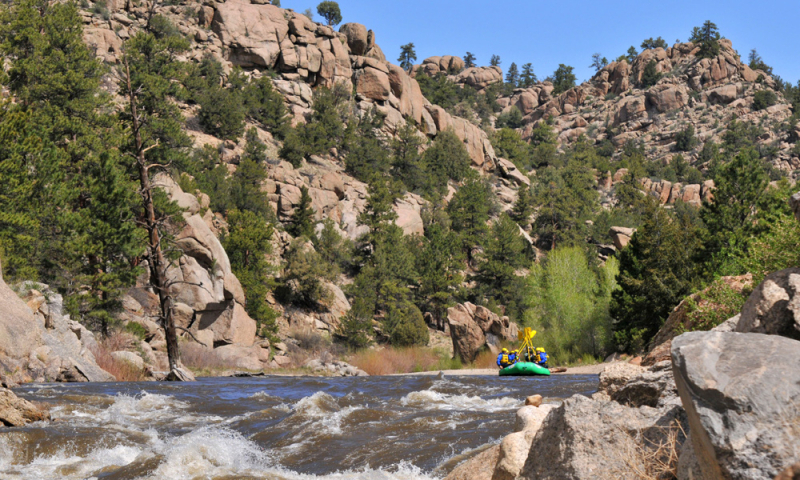 Lower Flow Period (May 1-15 & August 16-Labor Day): The difference between Browns Canyon and the Narrows during lower flows is the ability to successfully maneuver through rapids. The Narrows is not easily rafted due to the rocky and obstructed nature of the section, and therefore we do not offer trips here during the lower flow period. 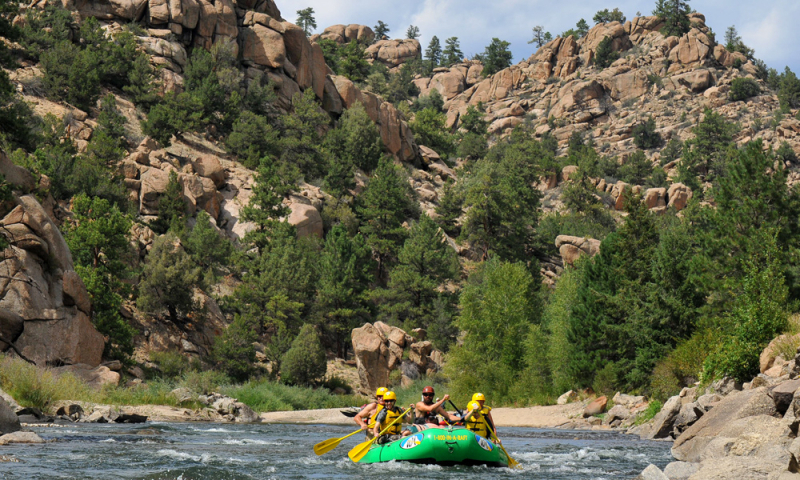 Trips through Browns Canyon are suggested as this section has more well-defined channels and the drops are steep and exciting. The rapids are technical and paddlers are challenged with executing tighter paddle maneuvers, while still getting splashed by the occasional larger wave. Moderate Flow Period (May 16-31 & July 16-Aug 15): During moderate flows, the main difference between Browns Canyon and the Narrows is the technical nature of the rapids. 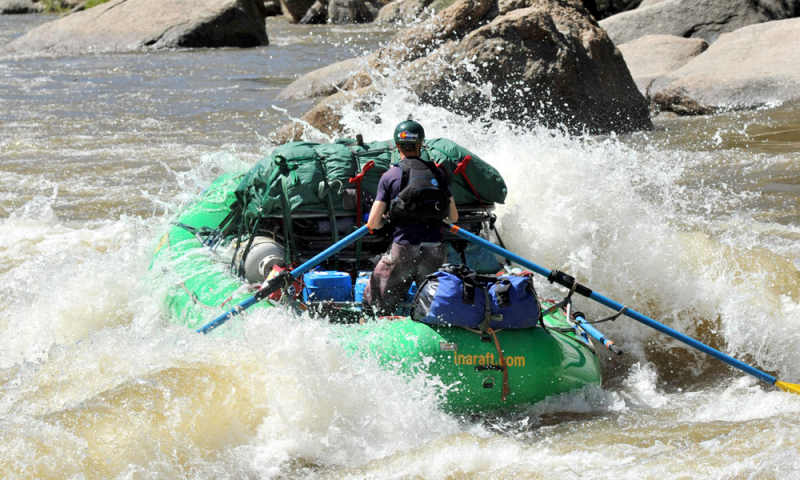 Rafting in the Narrows is challenging as you constantly maneuver to connect pools and drops. 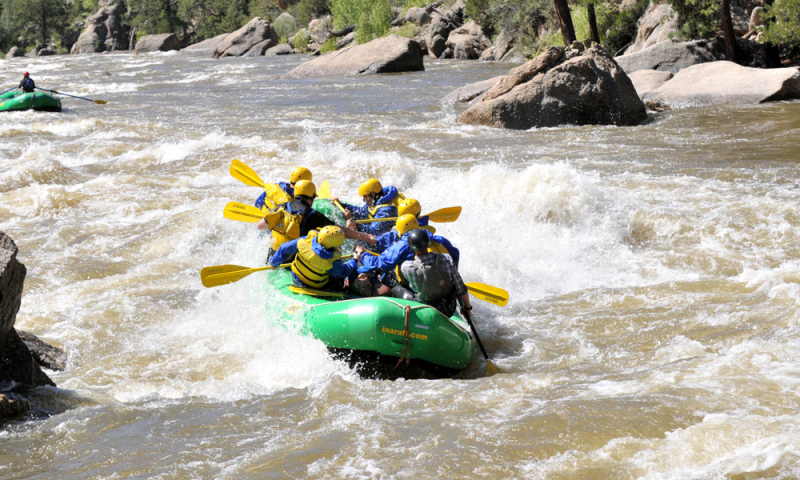 The rapids are fast-paced, smaller and more consistent compared to Browns Canyon, which sees larger, more well-defined rapids and calm breaks between the action during moderate flows. We offer only the Narrows ½ day trip during this time, not the Narrows Express, as the Narrows Express trip becomes a long day due to a stretch of mild water in the middle of the day. If you looking for a full day trip during moderate flow times, we suggest the Browns Canyon Full Day (min age 7), the Numbers Full Day (min age 14) or the Browns/Numbers Combo Full Day (min age 14). 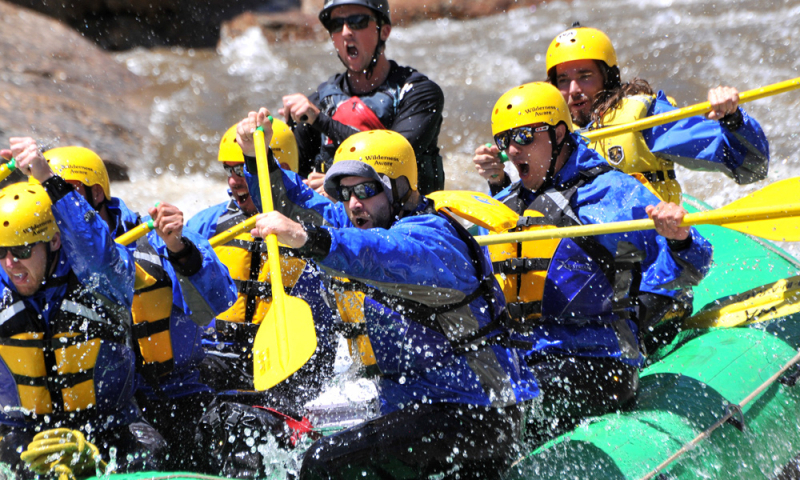 High Flow Period (June 1- July 15): During high flows, both Browns Canyon and the Narrows offer thrilling, fast-paced rapids with large, splashy waves. Browns Canyon will offer slightly more mellow water between these rapids, whereas the Narrows will be a very continuous section of whitewater with few breaks between rapids. The Narrows Express trip is a high-mileage adventure that demands a bit of stamina. When the water is at its peak in mid-June, our guides feel that the Narrows Express is our best trip! Keep in mind that minimum ages are often affected during high flows, often increasing to 8 yrs. or 12yrs. in Browns Canyon and possibly 16yrs. in the Narrows. Water Flows Note: The time frames listed above are based on an average flow year. We will adjust the trips that we offer if the water is higher or lower than what we expect. If you have any questions, do not hesitate to contact us – we are happy to help! *Youth must be age 8 or older and weigh at least 60 lbs. Minimum age is subject to increase due to high water, typically late-May through June. Price listed includes your lifejacket, helmet, guide, boat, transportation to and from the river, continental breakfast, snack after the trip and free use of our shaded dog kennel. The prices listed do not include 9% land and water access fees, cold weather rentals or guide tip.